I spotted this fantastic "box" in the February issue of Dwell. 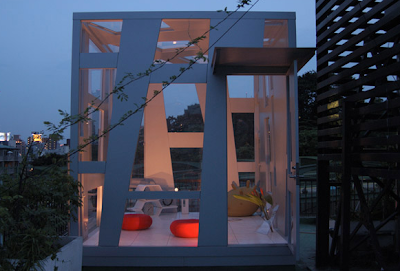 "The concept of Magic Box is based on 'fusion' of art and architecture. Our goal is to provide a type of space that people have never experienced before. It creates unique, innovative life styles and business environment; You are free to drive your imagination into transforming this box into your own working space or space for your hobbies." How awesome would it be to drop one of these in your backyard to use as a "grown-up" play house? Or set one in a field of wild flowers and use as your art studio. It could also be used in a public space as a gallery, cafe, or studio...what would you do with your own magic box? IMAGE VIA MAGIC BOX INC. WOW!! My own grown up playhouse in my backyard, I can picture it! With dim lighting to set the mood and vases of fresh flowers throughout. I would definitely use my box as a quite place to escape with a bottle of yummy wine and a great book. Of course I will invite the hubby sometimes.. I seriously want a magic box!! I've often wondered what it'd be like to have one of those custom made and plopped in my backyard. I'd love to turn it into a photography/art studio with a couch and tv added for hanging out. Oh, and a fridge and bathroom too. Maybe a little kitchenette. Like a grown-up's tree house. That'd be awesome! Gorgeous! I love it exactly how they captured it in the photo.